Resilient floor covering is a general term for a wide variety of professional and residential floor coverings. Resilient floor coverings are highly engineered to combine attractive design and colour with superior functionality. They are strong, comfortable to walk on, hygienic and easy to maintain. Poly Vinyl Chloride (PVC) or ’Vinyl’ floor coverings are amongst the widest group of resilient floor coverings that today are used in both commercial (project) or residential (home) environments. In essence there are two types of Vinyl floor covering types. 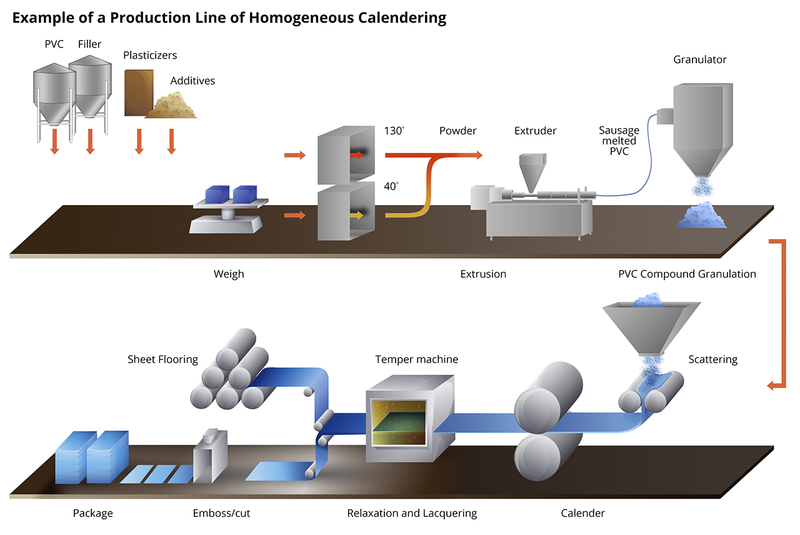 One, homogeneous vinyl which is characterized as one homogeneous layer of melted and pressed PVC chips that are produced as a sheet without a backing layer. The other, heterogeneous vinyl, where different layers of PVC are applied around a polyester or glass fleece which guarantees dimensional stability of the product. With heterogeneous vinyl both a wear layer (top) and a backing layer (bottom) can be identified. Where the design of homogeneous vinyl is created by the décor and colour of the chips that are used, the design of heterogeneous vinyl is created by direct printing or by using a printed film which serves as a decor covered by a transparent wear layer. Vinyl floor coverings come in many different qualities such as acoustic vinyl (with a high dB quality), safety vinyl (which is slip resistant), ESD vinyl (which has electrostatic dissipative qualities) and Luxury Vinyl Tiles, LVT (which are full vinyl modular tiles and planks with realistic high quality visuals, see also the modular multilayer section). A category based on a different technology is ‘resilient woven vinyl’ with carpet look. Vinyl floor coverings are very durable, easy to install, clean and maintain. Linoleum is a resilient flooring category which is made from renewable natural raw materials, such as linseed oil, rosin, wood flour, lime stone an pigments for colour that are mixed and calandered onto a jute mesh. Linoleum manufacturing is well over 100 years old and is renowned for its durability, practical cleaning and maintenance regime and easy installation. Linoleum has a natural bacteriostatic quality which makes that it inhibits the growth of bacteria on the floor. Linoleum when finished in manufacturing has a CO2 neutral foot print and can boast one of the strongest sustainable profiles in the resilient industry. Linoleum, originally was much used in health care and education facilities, todays’ linoleum with over 350 colours and a large number of visual structures can also be found in offices, retail outlets, premises for leisure and hospitality and transportation. 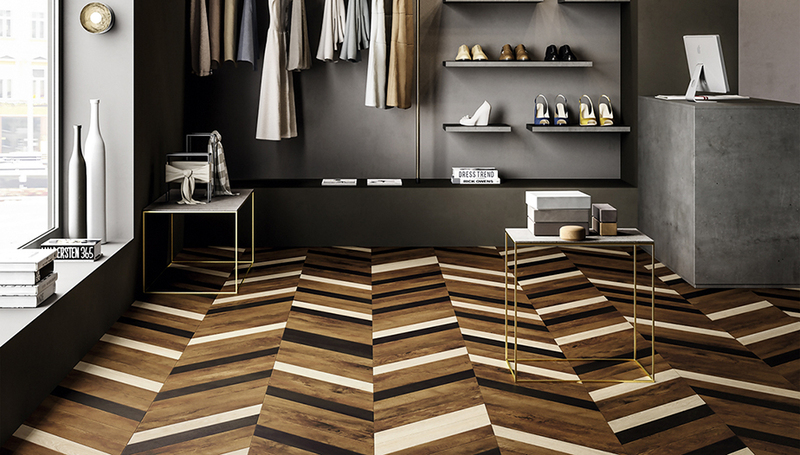 Linoleum is available in rolls as well as in modular planks and tiles formats, including click-floor options. Floor coverings made of caoutchouc are also known as rubber or elastomer floor coverings. Main components are high quality natural and/or synthetic rubber, natural filling material (chalk flint), environmentally compatible color pigments and additives for the vulcanization process. Due to the elastic properties, rubber floor coverings do not require any plasticizers and within the resilient floor coverings they are numbered among the non-PVC category. 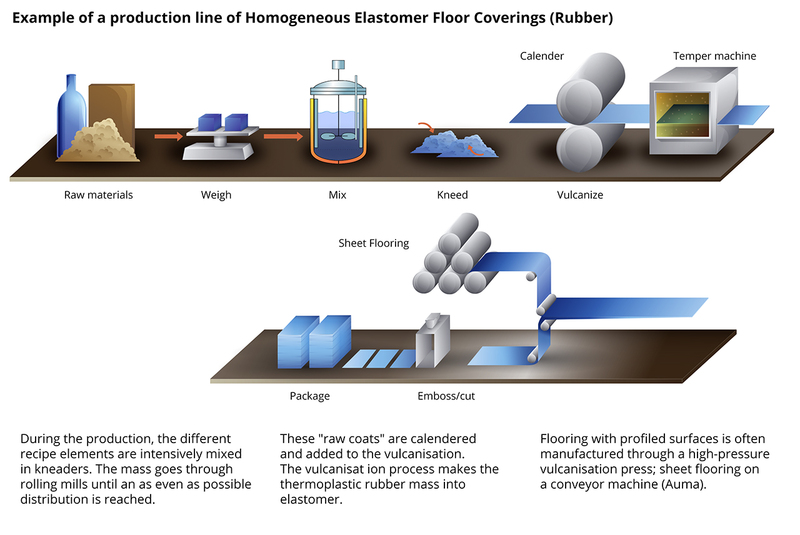 Although there are coated products in the market rubber floor coverings naturally do not need to be coated due to their closed and densed surface. The products are available as sheets, tiles and planks. They can have either a smooth or structured surface. Rubber floor coverings are extremely robust and durable, abrasion and cigarette-burn resistant and they will not get affected by short-term impact of oils and greases. Because of these performance criteria they are suitable for highly frequented commercial and industrial areas, such as warehouses, production plants or electrostatic protected areas (EPA). Cork is a natural material that comes from the bark of the cork oak tree, with unique and incomparable qualities that no ingenious human has yet managed to copy or improve. Its cell structure resembles a honeycomb, enabling it to act as a natural thermal and sound insulator and also providing shock absorbing properties. These exclusive qualities of cork make it ideal to use in flooring, as it grants an exceptional comfort while also being a renewable and sustainable resource. These types of flooring are heterogeneous resilient floor coverings fully based on polyurethane with thermosetting properties supplied in either roll form to glue or planks/tile form to glue or to click. 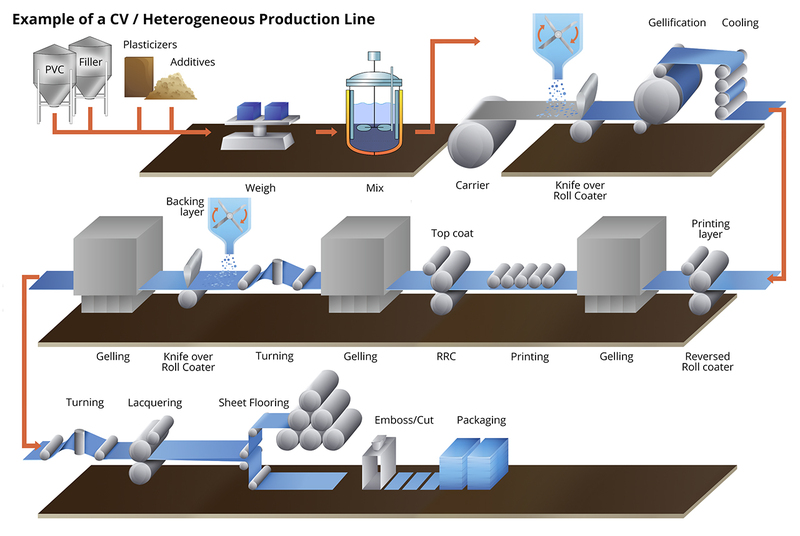 Polyurethane can be produced from petrochemical or organic resources. The floor covering consists of a wear layer and other compact layers made from polyurethane which differ in composition, chemical crosslinking and/or design and can contain a decor layer, reinforcement and other backing. In comparison to other elastic floor coverings polyurethane is extremely durable and resilient especially in terms of scratch and abrasion resistance as well as indentation. Furthermore there is no need for polishing the surface which leads to very low maintenance efforts and accordingly economic benefits. In addition organic polyurethane flooring is free of chlorine, solvents or plasticizers, it is odour-free and has no dangerous emissions. For declaration of organic polyurethane tiles ‘LOT’ which stands for ‘Luxury Organic Tile’ can be used. Products produced in compliance with EN16776:2016. 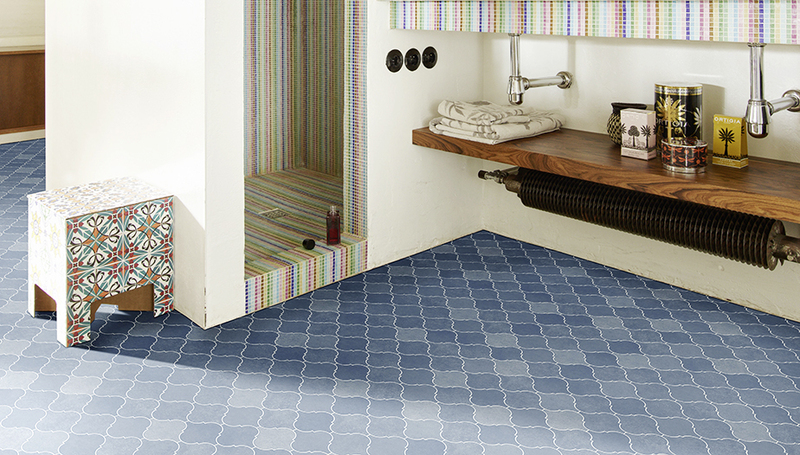 Floor coverings based on synthetic thermoplastic polymers are the family of resilients not based on PVC Polymers. 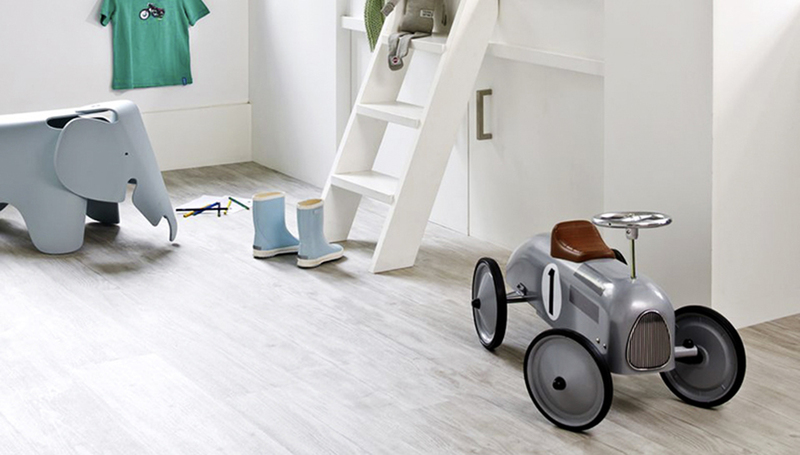 It is an entire family of flexible flooring solutions available in sheet, tiles and planks. They can have a heterogeneous or homogeneous composition. 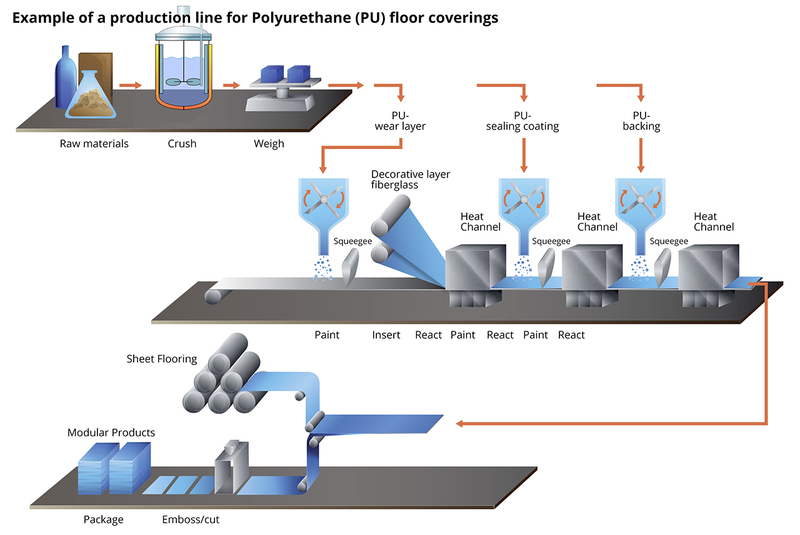 Synthetic thermoplastic floor coverings can provide different functionalities (acoustic, static control, slip resistance, easy maintenance etc.) to match a wide range of domestic, commercial and industrial applications. The products are produced in compliance with EN14565: 2004. Such products are floating for glue free installation, built up of several layers and with click joints. They can be configured in tile or plank form. The resilient surface material can be vinyl, linoleum, rubber, thermoplastic polymer, polyurethane or cork. A vinyl or thermoplastic polymer top layer can incorporate a printed film conveying a design, and is wear, stain, and water resistant, naturally quiet to walk on and is easy to keep clean. The backing layer can be alternatively high density fibreboard, a rigid polymer with or without reinforcement, or a mineral mixture. This layer imparts physical stability across a range of temperatures and makes the flooring more sub-floor tolerant. The thermal insulation provided by commercial versions of these products can reduce heat loss and reduce fuel costs in large open spaces in retail stores and offices. A useful contribution to Green Building programmes. 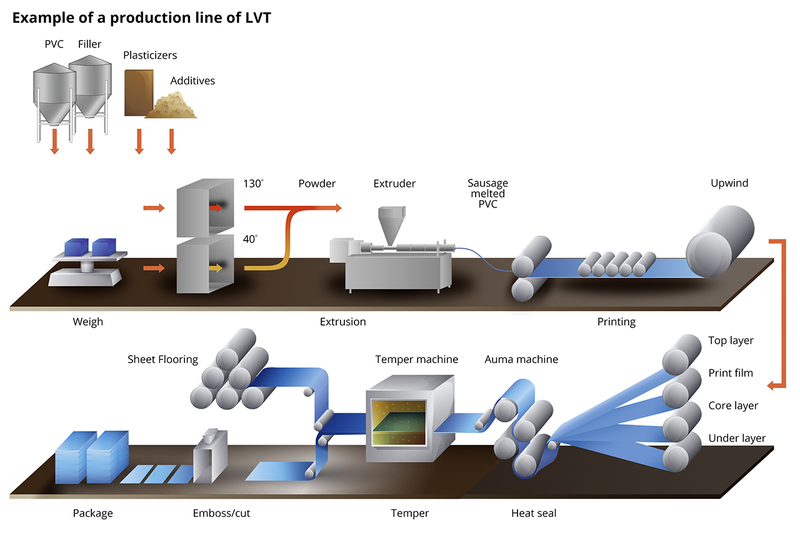 It is also possible to interpose a layer of an acoustically insulative material such as cork or foam material, and which can also be applied as a backing to the product to act as an acoustic barrier or underlay. Modular Multilayer Products can be designed for the widest range of conditions, from the home environment to heavy commercial installations in retail stores which need to withstand steel wheeled pallet trucks as well as thousands of foot falls every day without showing signs of wear. The products are produced in compliance with EN ISO 20326: 2018.